Home / News / PURITY NGIRICI is the real boss as she forces ANNE WAIGURU to cancel her meeting abruptly - See what she did to her yesterday? PURITY NGIRICI is the real boss as she forces ANNE WAIGURU to cancel her meeting abruptly - See what she did to her yesterday? 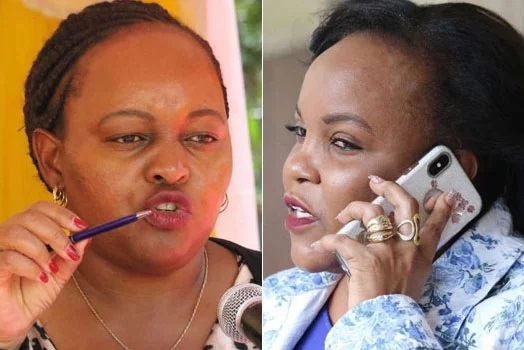 Thursday February 14, 2019 - Kirinyaga Governor, Ann Waiguru, was forced to cancel her meeting after rowdy youth allegedly allied to the County's Woman Rep, Purity Ngirici, stormed the venue. Waiguru was expected to issue Ksh16 million from the Women Enterprise Development (WEDF) fund to 16 women groups at Kerugoya Catholic Church Hall. But when she got wind of the meeting, Ngirici stormed the venue with hired goons and tore away banners claiming that Waiguru’s meeting was illegal. Ngirici further accused Waiguru and organizers of the meeting of undermining her by not inviting her to the function claiming that WEDF was part of her docket. It forced the organizers to cancel the meeting after it turned chaotic. Waiguru has since expressed her regret that an elected leader could cause mayhem at an event aimed at benefitting residents. “In this day and age such things should not be happening in politics, we need to work as a team but some elected leaders are going around to stall development for personal gain,’’ stated Waiguru. The function was to be graced by Cabinet Administrative Secretary in the Ministry of Public Service, Rachel Shebesh. Waiguru and Ngirici, who were once friends, have been in a fierce feud since the 2017 elections.